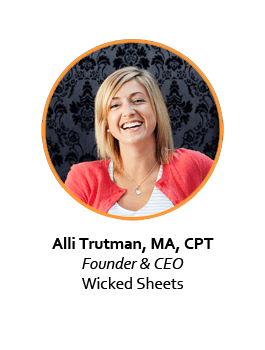 Alli is the founder and CEO of Wicked Sheets. In 2012, Alli won the Louisville Venture Connectors “Venture Sharks” pitch competition for Wicked Sheets. She used the $5,000 winnings to fund a trip to the annual North American Menopause Convention where she gained the support of 60 medical professionals specializing in women’s health issues. Alli is also an adjunct professor of Psychology at Bellarmine University, and works as a behavior therapist for children diagnosed along the Autism Spectrum. Alli holds a master’s degree in Psychology from the University of Louisville, is a certified personal trainer, and a recent grad of the Kauffman FastTrac program for Louisville entrepreneurs.